Knights of Creativity Spirit & Ale: Today is National Happy Life Day! 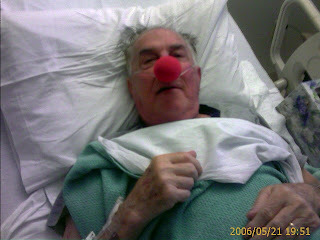 This is my father, Sir Kenneth of Wells, clowning around just a few days before he died from lung cancer. Sir Kenneth carried joy and a peaceful attitude all the way to the end. So, whatever it is that is getting you down today, remember that you have MUCH MORE TO BE HAPPY ABOUT! Gratitude is the Attitude of a true Knight of Moleskine, Spirit and Ale. So, don't worry...be happy! Sir Hook, thanks for the image of your dad. Happiness is not created as a result of certain conditions. Certain conditions are created as a result of happiness. Events are opportunities for me to decide, and be, WHO I AM. Sorry to hear about your father. Great things come from laughter!, even people.